Giovanni’s Deli World. Operating since 1989, Nicholas and Giovanni Esposito airfreight quality cheese from Europe. You’ll pay a little extra but Italian Parmigiano-Reggiano is cut from the wheel, or pear-shaped Provolone is sliced into chunks. 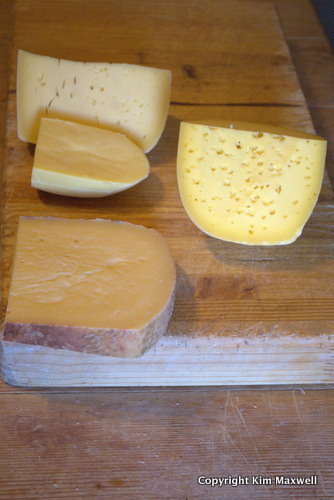 Also find Spain’s sheep’s milk Manchego, Danish Esrom, Greek goat-and-sheep feta, Dutch (young and old Gouda, Boerenkaas, Leiden, Gouda with mustard) and French signatures, plus Swiss Appenzeller. Main Road, Green Point. 021-434-6893. A version of this appeared in The Times on 11 March 2015. Thanks for pointing that out. When researching stories for The Times my primary focus has to be Cape Town locations first, then country spots, so you'll see the majority were in Cape Town itself. Just so you know, my criteria wasn't necessarily in finding the biggest selection but also ensuring there was solid cheese knowledge from the people behind the cheese counters. I was impressed by how many of the imported cheeses were directly sourced from smaller farms and not commercial brands, and the retailers could tell those stories. Similar principles applied to the local cheeses. Wild Peacock has a great reputation and I don't doubt there is a great cheese selection and expertise for anybody looking.